Preheat oven to 325°F. 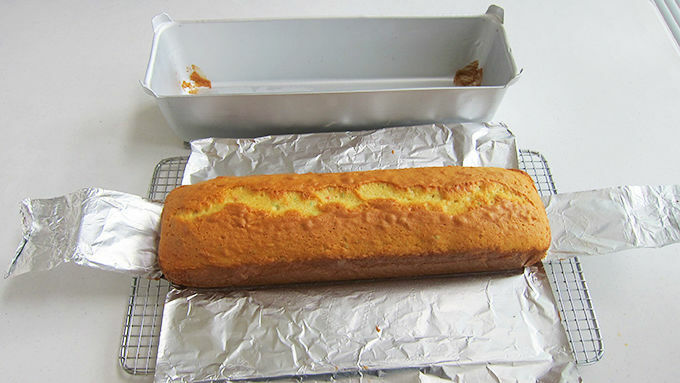 Line a 16x4x4.5-inch loaf pan with non-stick tin foil or grease it with shortening and dust it with flour. Make one cake mix according to package instructions. Pour batter into prepared pan. 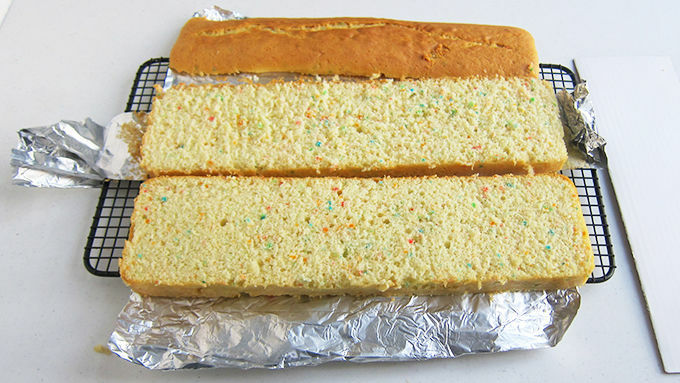 Bake for 48-52 minutes until a toothpick inserted in the center of the cake comes out clean. Cool cake for 10 minutes. Remove from pan and cool on a wire rack. Clean and rinse pan with cold water and make the second cake as above. Once both cakes have cooled, cut off the mounded top, and cut each cake into 2 layers. Frost in between layers and around the cake. 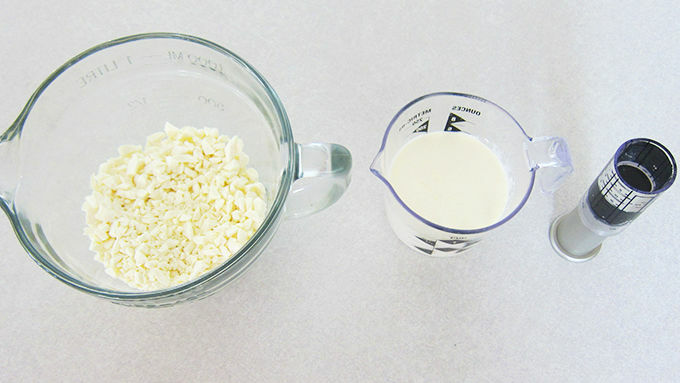 Prepare the ganache by mixing together the chopped white confectionary (or white chocolate), heavy whipping cream, and corn syrup. Heat in the microwave on high for 30 seconds. Stir. Heat for 20 seconds, then let set in microwave for 1 minute. Stir. If not all the confectionary or chocolate is melted, heat for 10 second increments, stirring after each. Divide ganache into 7 bowls. 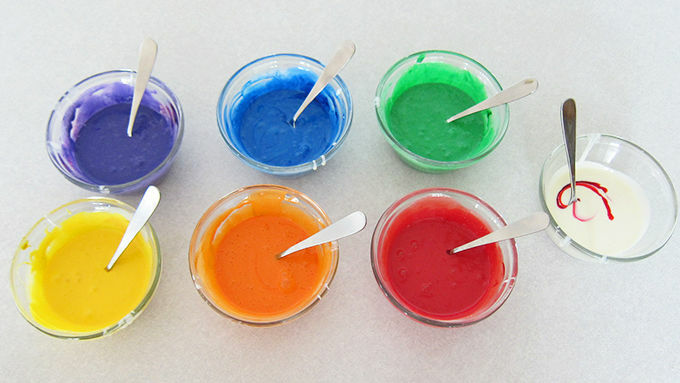 Color each bowl of ganache using candy coloring creating a purple, blue, green, yellow, orange and pink. Start at one end of cake and pour a spoonful of purple ganache over the top edge allowing it to drip down the sides of the cake. Next to the purple add a spoonful of blue, then green, yellow, orange, red, then pink, repeating this as you go around the entire cake. 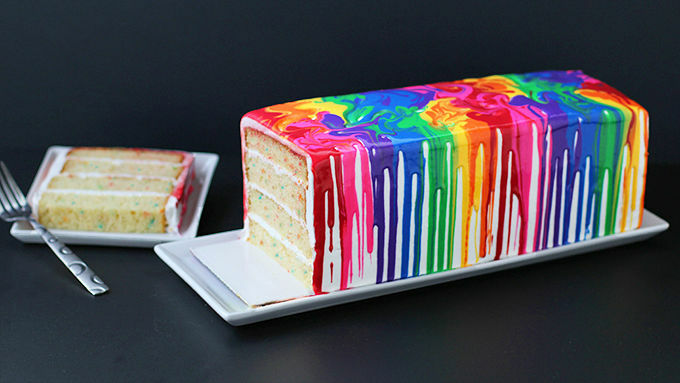 If desired, swirl the colors on the top of the cake. If the ganache becomes too thick, heat it in the microwave for about 10 seconds to thin it out. When ready to serve, cut into 20 slices. Melting crayon artwork is a hot trend right now. When I saw a beautiful cake created by Shelly at Cookies & Cups using a rainbow of colorful white chocolate ganache dripping down the sides of a round cake, I knew I wanted to make it for a friend's upcoming birthday party. She loves rainbows and coloring with her kids was one of her favorite pastimes when they were young, so it was perfect! I needed a lot of cake for her party and wanted the entire rainbow of colorful ganache to show really well, so I chose to make a very large rectangle cake. I used Betty Crocker's Party Rainbow Chip Cake Mix so the inside of my cake was colorful too. My friend also loves frosting (especially Betty Crocker's Whipped White Frosting) so I created four cake layers and added frosting in between each. To make the colored ganache I used super white confectionery coating instead of white chocolate because I wanted really vibrant colors. White chocolate is cream-colored (not white), so the pink and red would look a bit orange and the blue a bit green if I used it. But either works well, so just use what you can easily find. You can purchase the super white or bright white confectionery coating at craft stores. You're going to need a 16x4x4.5-inch loaf pan to bake your cakes. I find it easiest to line my pans with non-stick tin foil, it will make cleaning up easier. The cakes come out of the pan with ease, and clean up is a snap. Alternatively, you can grease it with shortening and dust with flour, or use non-stick cooking spray. But, if you've lined your pan with foil, you can pop the cake out of the pan easily then rinse the pan in cold water to cool it off and prep it again for the next cake. I was actually able to peel the foil off the warm cake, wipe it clean and use it again for my next cake. Cut a cake cardboard into a rectangle that's just about 1/4-inch bigger on all sides than your cake. Set one cake layer on the board. 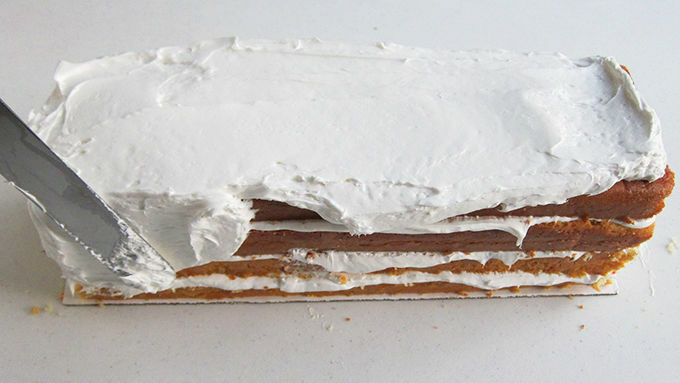 Spread frosting over the layer, set another cake on top and repeat until you have all four layers stacked. Frost the entire cake and smooth it out as best you can. I find it easiest to freeze my cakes before frosting, and then freeze them again for a while until the frosting hardens a bit. I then run a damp paper towel over the cake to remove any ridges in the frosting. 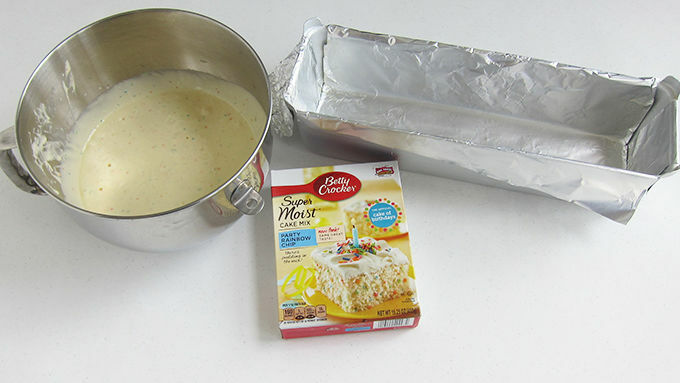 If you froze the cake, allow it to come to room temperature before the next step. You don't want a cold cake when you drizzle on the colored ganache or it won’t drip nicely. There are several ways to make the ganache for your cake, but using the microwave is the easiest. When you're ready to drizzle the ganache over the cake, it's easiest if you set the cake up on two frosting tubs. Then set that over some parchment or wax paper. That will catch all the colorful drips. Start at one end of the cake and pour a spoonful of purple ganache over the top edge, allowing it to dribble down the sides. Add blue next, then green. 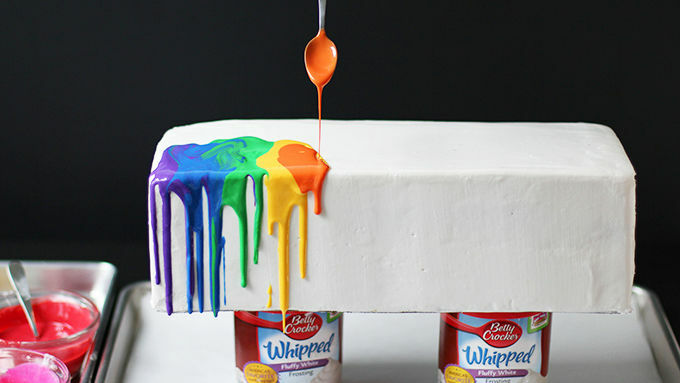 You can use a spoon to swirl the ganache colors on top of the cake if you like. The finished cake will look fun with swirled colors or solid colors. Either way is fine. Allow the colored ganache time to dry before you pick up the cake and put it on platter.